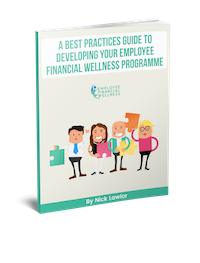 It can be difficult to ensure your Financial Wellness programme is effective across your organisation with the many facets to consider. From our experience, when assessing how to construct a financial wellness programme for your employees you should consider your employees in 2 distinct categories. The employees who, unless they change their financial behaviour, will suffer from financial stress in the future. Let me deal with both of these categories in more detail for you. These employees will be the ones that will be actively looking for assistance and be very keen to engage with a financial wellness programme. They recognise that they are experiencing financial difficulties and will be very keen to hear what solutions impartial financial planning guidance might give. Also keen to engage with an Employee Financial Wellness specialist individually as they may not be too interested in asking a question in front of their colleagues. 2. The employees who, unless they change their financial behaviour, will suffer from financial stress in the future. These employees will most definitely be interested in engaging with a financial wellness programme. However, they are likely to look to a financial wellness programme for confirmation that they are doing the right thing with their money. The perception for these employees is that their money is working well for them. Quite frequently, these employees are managing well today but may not have looked at the future in that much detail. Frequently, they want to know about targeting future events and how to quantify the costs of those events. Employee Financial Wellness teaches employees how to zoom out on their finances and have a birds-eye view of the current situation and plan for the future. We look to show employees how to make their current financial set up as efficient as possible, so they are not wasting any money today. We help employees identify their own future financial events and how to attach a hierarchy of importance to each. The next stage shows employees how to quantify those future financial events. We show employees how much their kids’ education is likely to cost in 5, 10 or 15 years’ time. We show them what a comfortable retirement might look like and how much they should save now to get it. We show them how to calculate the amount of life insurance they should really have. Finally, we show employees how to best get to their future financial target. It’s like being faced with a junction with 8 roads to the same destination. Which one employees should pick can be narrowed down to the one that suits them best. For example, employees might insure against illness or death instead of savings towards these goals. They might use market-based equity funds to save for retirement and low-risk cash deposits to save for short-term emergency savings. Our goal is to show employees how to arrive at financial events in their lives, have the appropriate costs set aside to deal with that events and then they can sail on through it! This will reduce or eliminate financial stress form their lives! Employee Financial Wellness is delivered through targeted seminars, clinics and 1-1’s. We can take the theory of financial wellness and tell the masses, and then deliver that message in an individualised way for employees to get real value in their lives through a functioning financial plan that works for them and their own set of circumstances. These employees will most definitely be interested in engaging with a financial wellness programme, but they are likely to look to a financial wellness programme for confirmation that they are doing the right thing with their money. These employees feel that their money is working well for them. Quite frequently, these employees are managing well today but may not have looked at the future in that much detail. They often want to know about targeting future events and how to quantify the costs of those events. Join our mailing list to receive the latest Employee Financial Wellness news and updates from our expert team.